by Lorna Hannan, June 2008. Hundreds of women and men in North and West Melbourne played their part in getting women the vote in Victoria. 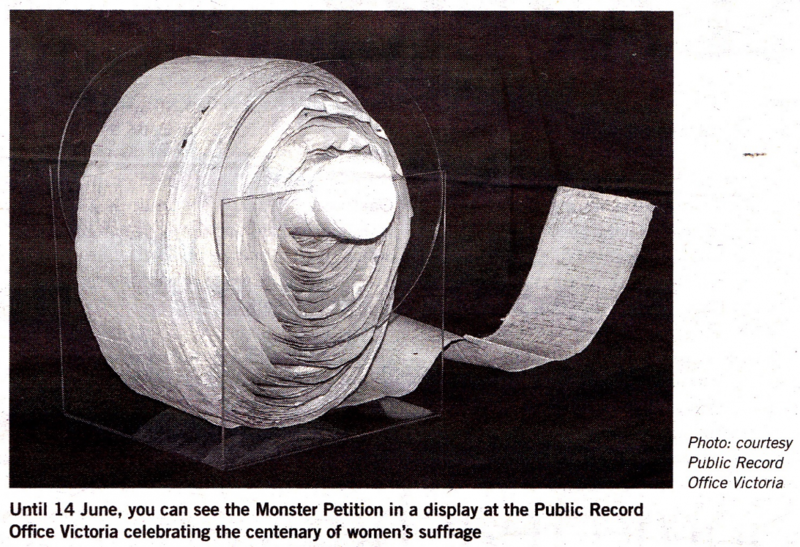 Some 800 women who lived in our patch 0 signed the famous Monster Petition in 1891, asking that "Government by the People and for the People should mean all the People and not only half'. For the most part, the petition was carried from door to door. Until 14 June, you can walk down and see the petition itself displayed at the Public Record Office Victoria, which is at 99 Shiel Street, North Melbourne. You can also log on at home and find out if someone who lived in your street or even in your house signed it. As for the men, such was the enthusiasm for getting women the vote that there were a number of smaller petitions that circulated in North and West Melbourne and which some of them signed. Predictably, in the same year, more than one counter petition went to Parliament objecting to the very idea that women should vote. One stated that: "Many women have neither the time nor opportunity to inform themselves concerning great public questions without neglecting the training of their children and the comfort of their homes." This petition and others in the same vein were not only smaller than the Monster Petition but they were also not so successful. The successful petition is linked to tr one-time West Melbourne and later North Melbourne resident Dr William Maloney. He was the first person in the Parliament of the Colony of Victoria (some say in the world) to move that women should have the right to vote. In 1889 he had become the Member for West Melbourne. It was the first time he had stood and he was elected to the Legislative Assembly of the Colony of Victoria on behalf of the Workingmen's Political League. At that time, his majority came largely from the railwaymen's vote. Later, in 1904, he was to win the federal seat of Melbourne for the young Australian Labor Party and become our longest-standing representative. William (Billy) Maloney grew up in Roden Street in West Melbourne and attended the Mattingley school, the forerunner of the present-day Errol Street Primary School, which is now known officially as the North Melbourne State School. An ageing sign on the wall in Queensberry Street reads "Mattingley's Lane" and is a reminder of the site of the original school. As a local doctor with a practice near the Victoria Market, Maloney was at early meetings of the women's suffrage movement hosted by his mother, Jane Maloney, in the house where he had spent his childhood. The Maloney house is no longer there. For a long time it had been No 3, several doors, down from King Street, but the houses were renumbered in 1889-90 and it became No 57. When his mother died, No 57 was Dr W. Maloney’s address for several years before he married and moved for a time to the corner of Canning and Dryburgh streets in North Melbourne. Although much of Roden Street, is intact, No 57 has been replaced. Prominent at the Roden Street women’s suffrage gatherings was Brettena Smyth, an Errol Street draper from whose business premises women also got health hints and contraceptive advice. Brettena was well known in the district and beyond, and frequently spoke out in favour of women’s rights at public meetings in the North Melbourne Town Hall. A lot of time and energy went into the cause of women’s right to vote during the late 1880’s and there were many local public meetings. The signatures of Jane Maloney and Brettena Smyth are both on one rather modest petition which was also signed by some local men and included gentlemen, a drayman, a blacksmith, a coach builder and several butchers. The cause grew and members of the Victorian Christian Temperance Union and the Victorian Women’s Suffrage Society were both determined and organised. During a six-week-long door knocking campaign across Victoria, their members collected some 30,000 signatures. The ultimate document - made up today of sheets stuck down on calico - is 260metres long. There is great variation in the colour of the ink, and the style of handwriting is quite different from that of today, but many of the names are easy to read and addresses are often given. Wherever the trains went, women went to collect signatures but the task of collection was easier in the city. Looking at pages from North and West Melbourne, you can see that neighbours often signed one after the other, suggesting that the petition was carried from house to house down the street. Other pages record more random addresses, which suggests that people signed at a meeting or a gathering like a church group. Reading though the petition was fun. However, I wondered why I did not find the names of any of the local women who owned or ran some of the 90-odd hotels in the area. Nor did I find the names of publicans’ wives. I may have missed some the Temperance Union, there is a plausible explanation for the absence of these women from the petition. Of course, it does not mean that they opposed the vote. It only means that they did not seek this way of getting it. It is interesting, too, that a number of those who signed used Hotham or Hotham Hill as their address, preferring the older name to the newer North Melbourne. The majority of the petitioners from these parts were women about whose lives we can know little - their names, their husbands’ names, the names of babies they brought into the world and who often died in the first few weeks or years of life. We can look at MMBW plans and find that their houses had outdoor lavatories and laundries, that the kitchens they worked in were often lean-tos at the back of the house, that some of their homes had hen yards and vegetable gardens. We can consult the records of deaths during the time and find that some who signed the petition did not live long enough to cast a vote themselves. The majority of Victorian women gained the right to vote in state elections in 1908. However, it was not until the 1960’s that the same right was extended to Indigenous women. Women photographed stepping out along Victoria Street past St Mary Star of the Sea in 1890 may or may not have wanted the vote. We cannot know, but we can identify Dryburgh Street resident Elizabeth Laurens, whose husband had been an MLA and a noted local councillor, the daughters of pioneer manufacturer John Buncle, who were by now living Brunswick but who had grown up in Hotham, and members of MoIesworth Street families - Mrs Clack, Mrs Cochrane, Mrs Cheese and two of the McMichaels, about whose lives we can learn more from Winsome Roberts’ book - Molesworth Street. We can also find Alfred Street resident Mary Jane Mattingley, a teacher at the local primary school. She was to spend the next few years mounting a case to the Supreme Court for pensions for women like herself who had been denied them despite many years in the teaching profession. Next time we vote, we may like to remember the many women who cared enough about the growth of democratic life and democratic practices to sign the petition on our behalf.